Politician, statesman, military commander of the federal Navy, leader of the Liberal Party and President of the Republic of Venezuela on several occasions, born in Caracas on February 20, 1829 and died in Paris, France, on July 28, 1899. Son of politician Antonio Leocadio Guzmán, began his studies in school independence. At age 19, he/she held his first administrative position, head of section at the Ministry of Foreign Affairs. In 1856, he/she graduated in civil law and the following year in advocacy. After various diplomatic positions, he/she returned to Venezuela in 1858, in moments in which Julián Castro overthrew the President Monagas. In 1859 he/she was banished from the country. He/She travelled to the West Indies and there met with general Ezequiel Zamora and Juan Crisóstomo Falcón. After the arrival of Zamora to chorus, in the year 1859, Guzmán Blanco embarked towards Venezuela to participate in the contest. The vessel was arrested and his crew were sent to Curacao. Together with Falcon and Zamora participated, as a military and as a specialist in law, in different battles undertaken by the Federation. This was the beginning of a stage of successive wars, until 1863, when the Treaty's car was signed. Through this Treaty, Falcon was appointed President, and Guzmán Blanco, 34 years old and with the rank of general, was appointed Vice President. During the subsequent years he/she returned to travel to the United States and Europe in diplomatic functions. 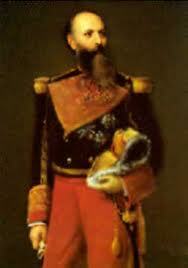 He returned to Venezuela in 1868, when Monagas defeated Falcon. By political problems he/she again fled the country in the year 1869. On April 27, 1870 he/she arrived in the country and waging battles called "Blue Revolution", took the capital giving, in this way, home to the gumancista period. The illustrious American, as Guzmán, called himself enjoyed three periods of Government: the seven years between 1870 and 1877, the five-year period, between the years 1879-1884, and the biennium, from 1886 to 1888. During the seven years he/she devoted himself to placate the "blue" or conservative. He/She managed to defeat them completely in 1872. In 1870 he/she decreed compulsory public education and came into conflict with the Church. In 1872, he/she drove out the religious country. The following year he/she established civil marriage and held the first national census. His administration was marked by construction: facades were repaired, squares were built, stood statues, was created the first Masonic Temple in the country, the ancient Church of Caracas became National Pantheon and attempted to erect a church independent of Rome. In 1877, the University awarded him the honorary title of Doctor of law and appointed him Rector. He/She handed over power to Francisco Linares Alcántara at the end of his period in 1877. Later he/she travelled to Europe with his family. With the death of Alcantara and the demolition of its statues, he/she decided to return to the country in the year 1879. He/She assumed the leadership of the movement "The claim", kicking off his five-year term. During this period established the bolivar as national currency, published the memoirs of O'Leary, approved the Constitution in 1881, declared the "glory to Bravo people" as the national anthem of the Republic, made the national census II and established the National Academy of language. Also, he/she inaugurated the Caracas - La Guaira railway and introduced the phone. In 1884 he/she handed power over to Joaquín Crespo. He/She returned to leave the country with his family as a diplomat. In Europe he/she learned movements against their Governments and planned its return for the period 1886-1888. He returned to Venezuela in 1886, with the triumph of the movement "The acclamation", whereby he/she was again appointed his presidency. Thus began the biennium. In this period he/she was attacked frontally and decided to leave the political sphere in 1887. Again he/she left the power this year and returned as a diplomat, along with his family, to Europe. From Paris, where fixed residence, argued the limits with England by the British Guiana. In 1889 he/she broke relations with Juan Pablo Rojas Paul, resigned from his diplomatic post and their statues were again demolished. In 1888, his fortune was estimated at 100 million francs. He/She devoted himself to writing his memoirs, which at present whereabouts is not known. He/She died in Paris, and his remains were is this city, until they were transferred to Caracas in 1999 on the occasion of the centenary of his death. They currently rest in the national pantheon.